October 17, 2017 — In late 2016, Mark Mason released his second CD, one that is part of what I consider a difficult genre: a CD about a place. Often it is the artist's hometown, as it was with Mark, but that is not mandatory. What is mandatory is that the artist find a way to tell a story about the place in a manner that will appeal not only to people who live there, or did, but to anyone who enjoys a portrait of a place, painted in song and not on canvas. 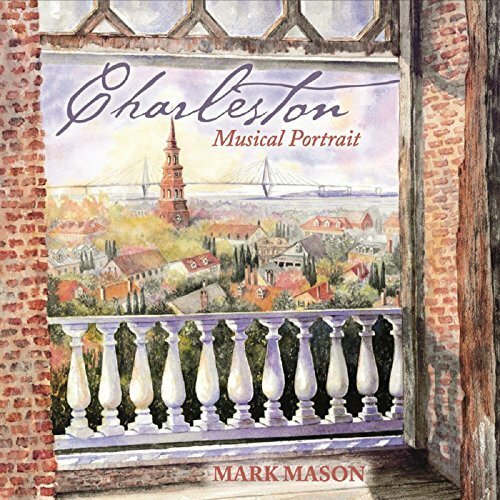 Mark has succceded with a flair; I have never been to Charleston, yet I love this album! The album tackles stories from the history of the nation as played out in his city. Starting with the city's origins in 1670 ("when King Charles made it so") , continuing with its importance in the Revolutionary War, and then the Civil War, Mark brings to life several key events in the city's — and the nation's — history. Music has always been an important part of history, and especially of war, so these stories lend themselves to musical treatment. By choosing famous battles on land and sea, Mark continues a tradition tracing back centuries. He combines historical songs (see my discussion of those songs below) with songs based on popular legends or special places in the city. I'm a sucker for historical songs (I wonder why?) so those are the ones I like best, but in fact every song is very good, both lyrically and musically. The album is available in MP3 format from Amazon and other digital services; the physical CD can be purchased from Mark's website or from CD Baby. Mark's style is definitely folk, although he ventures a bit into a bluesy style in "Burial Mound" (more about that song later). His influences most definitely include Gordon Lightfoot, but influences are not the only connection. Three of the musicians on this album are closely connected with Lightfoot: Rick Haynes, who produced and plays bass for Gordon and here; Mike Heffernan who plays keyboards for both, and Warren Toll who pays dobro, guitar, harmonica and spoons on this CD, and is Gordon't tour manager. Mark plays 12 string guitar and Gordon's influence can be heard throughout. Other credits go to Mark DeCarlo, who plays flute, Michael DiGiorgio who plays banjo and Jay Miley who gets recording, mixing and mastering credits along with Rick and Mark. Another song that intrigued me was "Burial Mound," billed as a true story, about two brothers who die in a plane crash, perhaps - as tradition warns - as retribution for removing something from a gravesite. I don't know if the gravesite incident is true, but the crash was.and the two brothers who died were among the 72 victims of the "9/11" plane crash of 1974, a short distance from the Charlotte airport and an intermediate stop for many who had boarded in Charleston. A bit of research brings to light the fact that the two boys were older brothers of Stephen Colbert, a fact not mentioned in the song (perhaps intentially). The crash was later ascribed to pilot error, although the song lyrics say the cause was unknown. I was only looking for information on the historical event when I learned this. All of these story songs bring historical events to life, and are mostly (if not totally) accurate. I'd say that Mark has learned the lesson well from Lightfoot's example. I think this is a wonderful CD! I received a copy of the CD from the producer.